Daisy is an independent, athletic Aire-girl, born Jan. 5, 2015, so 20 months old. Daisy has lived outside, going where she chooses, running up the mountains, chasing away bears. She has not known the comfort and security of living inside a home with her humans. She had a litter of pups with a neighbor dog this summer, but has now been spayed. She is skittish and timid with most people and never really warmed up to her dad though he loved her. However, if he was petting the other family dog, she would come to him for pets. Interesting, huh? She’s much more comfortable with other dogs than she is with humans. In fact, we believe she needs another dog in the home to be happy. The family has a 2-year-old son, so she’s known him since he was an infant. She tolerates his tugging at her beard and shows no aggression to him whatsoever. She has never shown any aggression to anyone or any animal. Daisy will need to be fostered to learn house manners and to learn that humans are her friends. She would be an escape risk and must always be in a secure area inside and out. Do you have the time and the patience to help Daisy become the Airedale she was meant to be? At less than 2 years old, she has many years to become your heart dog. I have owned two Airedales, one of which was rescue dog, and one of which was from a breeder. I love Airedales. Thank you for your comment, Paul. They are a special breed, aren’t they? 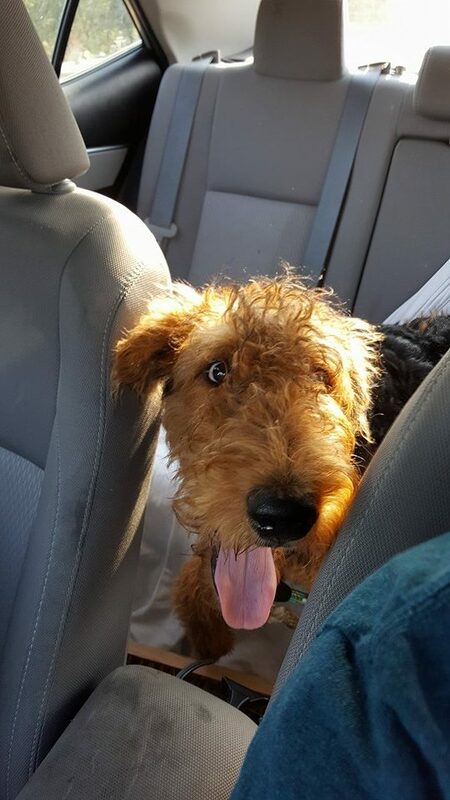 If you are interested in adopting a rescued Airedale and if you are in our region: NC, SC, TN, GA, or AL, please fill out an application and one of our volunteers will contact you. I have filled out an application last week. I want to confirm it was received as I have not heard from anyone at the rescue? Good morning, Mark. We received your application on 09/24. Please be patient and one of our volunteers will contact you to go over your application to determine what kind of Airedale would best suit your family. Thank you. My family is interested in Daisy. We have already submitted an application and been interviewed in our home. Daisy sounds like a great fit for our family. Please feel free to give me a call anytime. Hi, Brett. Thanks for contacting us about Daisy. She has been placed in a foster home and it looks like it will turn into her forever home. It’s been more than a year since we talked, so let’s try to talk again this weekend. Do you still have Scout? We’ll update your info and consider you for a child-friendly, dog-friendly Airedale. Thank you! What type partner did Daisy have? Are pups still available? Where are they? Hello, Luther. We are a rescue group, which means we take in Airedales that have been surrendered by their family or have turned up as a stray at a shelter. We spay or neuter all of our Airedales. We do not breed them. None of our Airedales have litters.